On July 10, 2007, Rinpoche advised dedicating the merits of reading and reciting, hearing, etc., the Sutra of Golden Light to the long and stable lives of the gurus, and especially to the long and stable life of His Holiness, the Dalai Lama. He also advised dedicating the merits so that obstacles to your own Guru’s projects are eliminated. 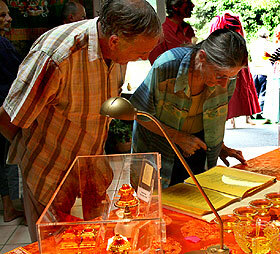 He mentioned dedicating merits to eliminate obstacles to any of His Holiness’s projects, the completion of the Maitreya project, and other immediate projects. Rinpoche also recommended dedicating the merits so that all war, violence, terrorism, destructive weather, diseases, and famine is eliminated, and that everyone enjoys peace, plenty, good health, and has love and compassion in their hearts. In prostration to the golden conquerors. In dedicating the merits of yourself and others, think of your own virtuous actions of reading, reciting, and even thinking about this king of sutras. Then think of specific wars, areas of famine, terrible diseases and afflictions, physical and mental acts of violence, and dedicate the merits so that these are eliminated immediately. Swiftly and wholly consuming all karmic obstructions, by making confession through Sublime Golden Light, I shall abide on the ten bodhisattva grounds – those mines of supreme precious jewels – that I may shine with a tathagata’s marks and signs and free beings from the ocean of existence. Without understanding how your inner nature evolves, how can you possibly discover eternal happiness? Where is eternal happiness? It’s not in the sky or in the jungle; you won’t find it in the air or under the ground. Everlasting happiness is within you, within your psyche, your consciousness, your mind. That’s why it’s important that you investigate the nature of your own mind.